Tahun 2016 silam, Tripadvisor salah satu situs wisata terpopuler di dunia, merilis 10 restoran paling unik di dunia, dan satu diantaranya ada di Indonesia, yakni Kafe Jamban yang ada di Semarang. Nah, ditahun 2017 ini, kembali lagi tripadvisor merilis 10 Restoran Paling Unik di Dunia versi ulasan pengguna aplikasi dan situs web mereka. Akankah Kafe Jamban di Semarang kembali masuk 10 Daftar Restoran Paling Unik di Dunia Versi Travellers' Choice Tripadvisor? 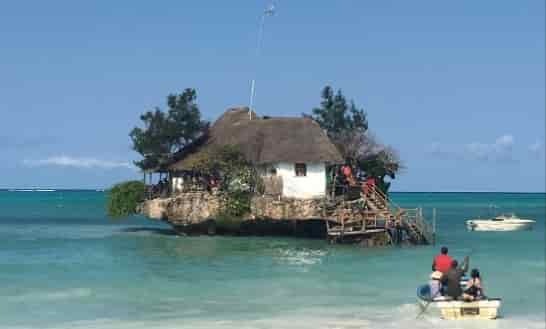 "I'd seen this place in various online magazines, that it was amazing and a definite must when in Zanzibar. We were shuttled in and shuttled out so fast we barely got to enjoy either the food or the atmosphere. Waiters rushed us. Cocktails were somehow not that nice, too sweet. Food was mediocre. The cerviche had an excessive sauce I couldn't initially eve see the fish. The prawn and calamari tempura had only one prawn and a huge amount of deep-fried carrots and courgette. The location doesn't justify any of it, have been too far better restaurants in Zanzibar. Do yourself a favor and avoid. 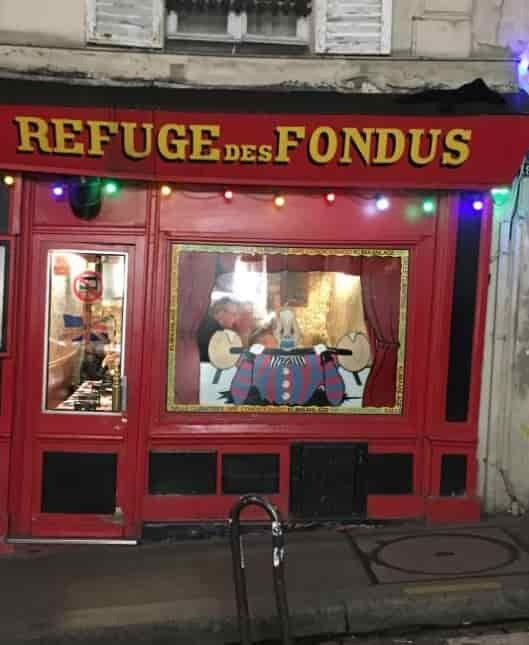 I'm sure the original reviews that got this restaurant into Grazia and Vogue were legit, but maybe this place has gone downhill as a result of the massive surge in customers and attention." kata jojorosie dari Kampala. "Having eaten here twice before, I thought I knew what to expect. Well, I was surprised. The new menu was a sensory sensation. The highlight was the wine pairing - culminating in the Lobster main extra 40 on the menu... But so worth it." 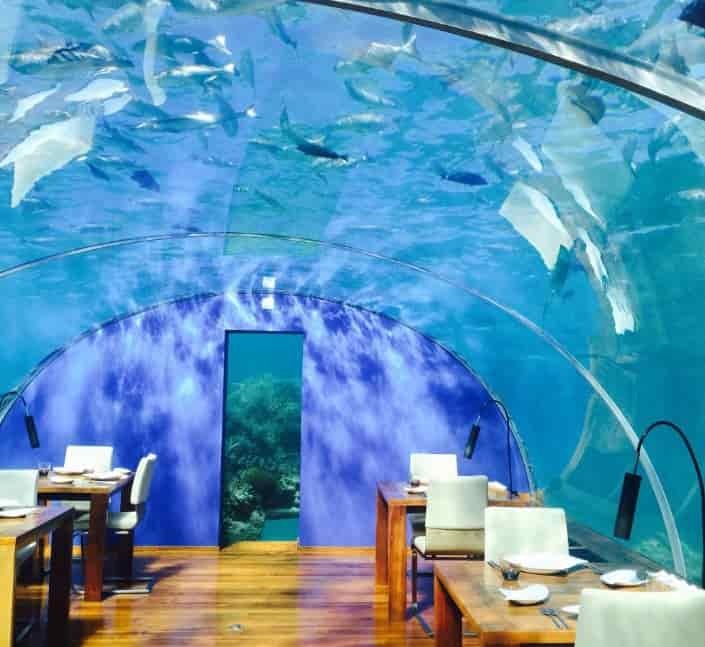 "Not an everyday dinner option, but for the first underwater restaurant in Maldives - there is a reason it still thrives." "Make sure you book in advance to avoid disappointment"
"Lovely lunch in a unique setting"
"Booked for a birthday lunch about 2 months ago." "A Very stunning structure as you approach, beautiful log fire as you go in which was welcome as it was very cold today." "Had vegetable soup as a starter which was very tasty, the bread with it was lovely." "Both had burgers, mine was quinoa, hubby was beef (wanted the lamb burger but they were out)"
"Quite tasty, chips were yummy." "Decided against dessert but then the waitress brought over a little birthday brownie which was a lovely surprise." "Was definitely a lovely experience"
“This place is the best thing EVER!” That’s an actual quote from our 17 and 11-year-old boys. 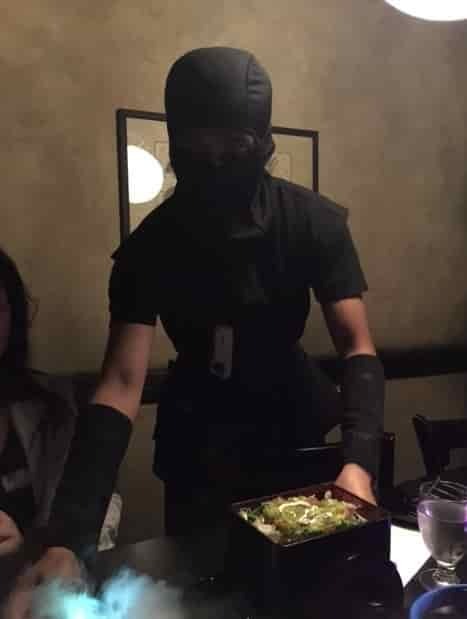 So much fun, the ninja’s jumping out at you, the atmosphere, the staff, made it a great dinner. The food was expensive and was just average to taste but really it’s about being together and enjoying ourselves. It was the coolest dinner we’ve had in a while." Kata AnnMarie Pdari Langhorne, Pennsylvania. "We went to discover a new concept - very novel to sit in the dark and explore the flavors. The only drawback was the multiple people shushing other tables around us - it was very distracting and did not allow us to enjoy the experience with each other. A once in a lifetime experience, I don't plan on returning." kata 860binab dari Kennesaw, Georgia. 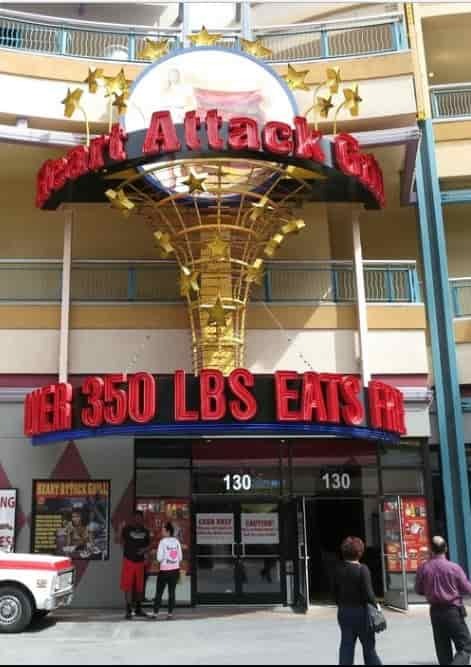 This is a great place it's a must visit if you're going to Vegas, complimentary paddle if you want it or eat your meal and you won't get paddled at the front!! Food was tasty and got served quickly despite it being busy, read ahead before you come so you know what to expect is my advice. Kata George R Southend-on-Sea, Inggris Raya. 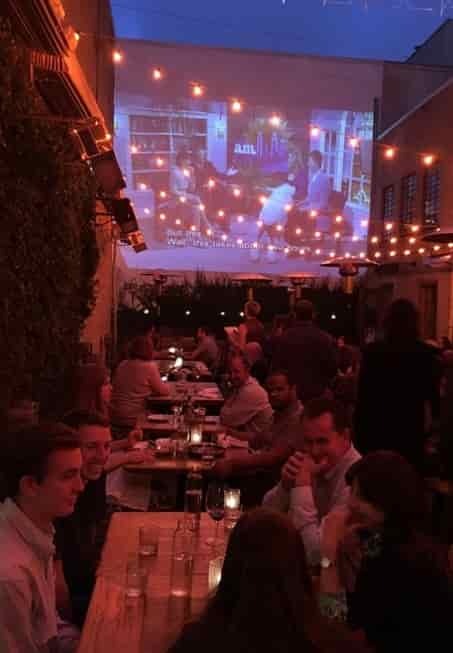 "My son and I dined at Foreign Cinema when we were on a short stay in San Francisco in October 2017." "What a gem! We booked for 6pm and had a table in the main dining room which is so charming." "The big fireplace and the beautiful big fresh flower arrangement in the center of the minimalist industrial decor room contributed to the overall ambiance." "Service was prompt and professional. We started with Warm Mediterranean mixed olives followed by the half Dungeness Crab which was delectable." "My son had the Sesame Crusted Chicken while I had the Fillet of Duck. Both were outstanding! 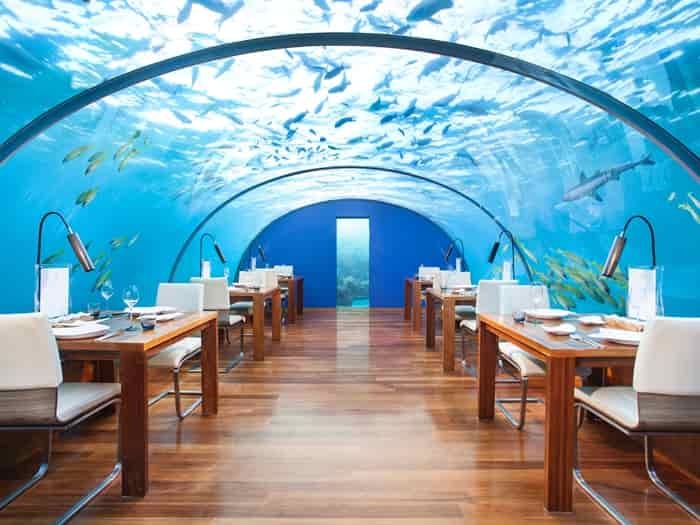 Highly recommended as a fine dining experience." Kata Dianne O dari Brisbane, Australia. "Well, it was a great experience! The place was very easy to find. Staff was very friendly. The cheese was great, as well as the starters." 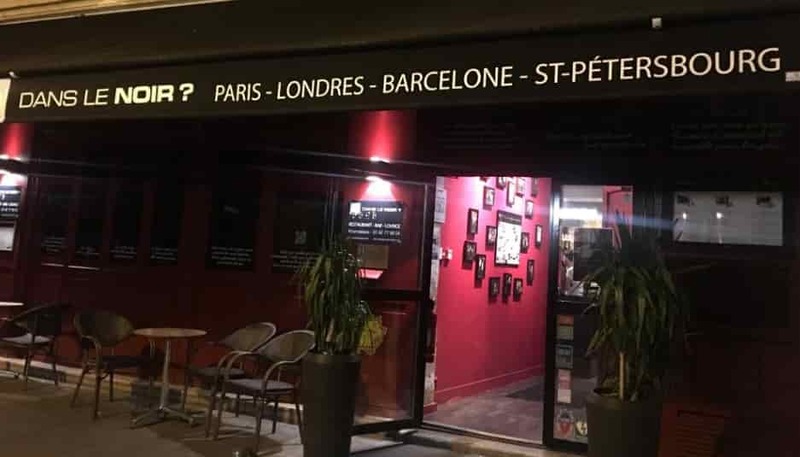 Kata Ahmed H.
"Lovely venue, service, and food average"
"On arrival, there was a queue out the door of customers that had reserved tables, although we were 5 minutes late we still had to join the queue. Luckily the queue was fast moving." "The venue is lovely and really something special. 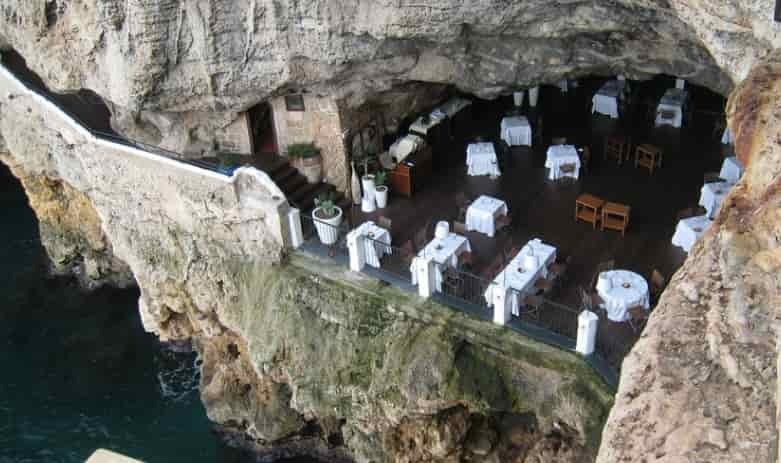 The crashing of the waves, the coziness of the cave and there was a saxophone player too." "It took a while for the waiter to take our order. To be honest the operation of the staff was chaotic. Staff running everywhere, nobody had their set tables to look after so it felt a little disorganized and not very personal." "The presentation of the food was lovely but the taste/ flavors were unfortunately not the standards of a fine dining establishment. We went to the Mirabelle in Rome 3 nights before and paid roughly the same price, food and service there was impeccable." "Our reservation was dinner which the sitting is 19:30, I would recommend reserving the lunch sitting so you can see the sea/waves and request a seat by the balcony, otherwise you have a view of darkness, you can hear the sea but can't see it..."
Overall yes the restaurant is lovely but I do feel it is a little over rated. "Benar-benar direkomendasikan untuk sebuah pengalaman yang menakjubkan"
"Aku telah mendengar tentang restoran ini dari sebuah artikel rollercoaster saya membaca online, dan setelah melihat gambar itu, aku tahu aku telah membuat reservasi." "Restoran sulit untuk mendapatkan pada transportasi umum karena hotel ini keluar dari jalan, dan di lokasi industri yang sangat aneh. Di puncak musim panas, dimana setuju karena sepertinya tidak ada ventilasi. Mendapatkan lebih dari ini, kita melanjutkan untuk memesan di ipad-jenis perangkat. Segala sesuatu yang tersedia untuk pemesanan pada tablet itu, dan setelah kami telah memilih makanan kami dan minuman mengetukkannya pada allerto yang melayani (sangat dingin!). Seperti yang diharapkan, makanan dan minuman turun di jalur rollercoaster yang berjalan melalui seluruh restoran. Ini adalah benar-benar menakjubkan. Makanan yang baik, tapi mungkin terlalu mahal untuk apa yang itu." "Secara keseluruhan, saya pasti akan merekomendasikan restoran ini sebagai aku tidak tahu apa lagi yang seperti itu dan itu adalah sangat keren!" Namun sayang, jika anda ingin mencoba merasakan sensasi restoran yang menakjubkan ini sekarang, tidak akan pernah bisa anda lakukan lagi. Karena restoran ini sudah TUTUP. Ternyata, tahun 2017 ini, tidak ada satupun restoran unik dan aneh dari Indonesia, yang masuk kedalam 10 Daftar Restoran Paling Unik dan Aneh di Dunia Versi Tripadvisor Travellers'. Happy Traveling!